In this blog post I summarise all the organic tests required for A Level Chemistry. If you have not already done so, you should read my previous post and ensure that you are familiar with the chemical tests listed here. Mechanisms for some of the reactions listed below can be found here. Alkenes will react with bromine water to form a halogenoalkane. Bromine water is orange but the halogenoalkane formed will be colourless. Carboxylic acids will react with metal carbonates to produce a salt, water and carbon dioxide. Sodium carbonate is as good a choice as any. Effervescence will indicate the production of a gas and bubbling it through limewater will confirm that the gas is carbon dioxide. The presence of a halogenoalkane (except fluoroalkanes) can be confirmed by first carrying out a nucleophilic substitution reaction with aqueous sodium hydroxide solution. A small quantity of ethanol is also required to dissolve the haloalkane. Gentle heating will produce an alcohol and liberate halide ions. The halide ions can be detected using nitric acid followed by silver nitrate. Chloride ions will produce a white precipitate, bromide a cream precipitate and iodide produces a yellow precipitate. It is very important that any unreacted hydroxide ions are removed completely to give a neutral or acidic solution as silver hydroxide will also produce a precipitate. The A Level syllabus requires candidates to be able to carry out a chemical test to distinguish an aldehyde from a ketone. There are two chemical tests that will give a positive test for an aldehyde but not a ketone. Fehling’s solution (a mixture of solutions of copper sulphate and sodium hydroxide) is a blue solution which when gently heated with an aldehyde forms a red precipitate of copper(I) oxide. Ketones do not undergo a visible change. Tollens’ reagent (known as ammoniacal silver nitrate) when heated with aldehydes in a boiling tube forms a silver mirror on the inside of the tube. Ketones do not undergo a visible change. Alcohols are classified as being primary, secondary or tertiary depending upon how many alkyl or aryl groups (commonly known as “R” groups) are attached to the carbon atom that is attached to the hydroxy group. 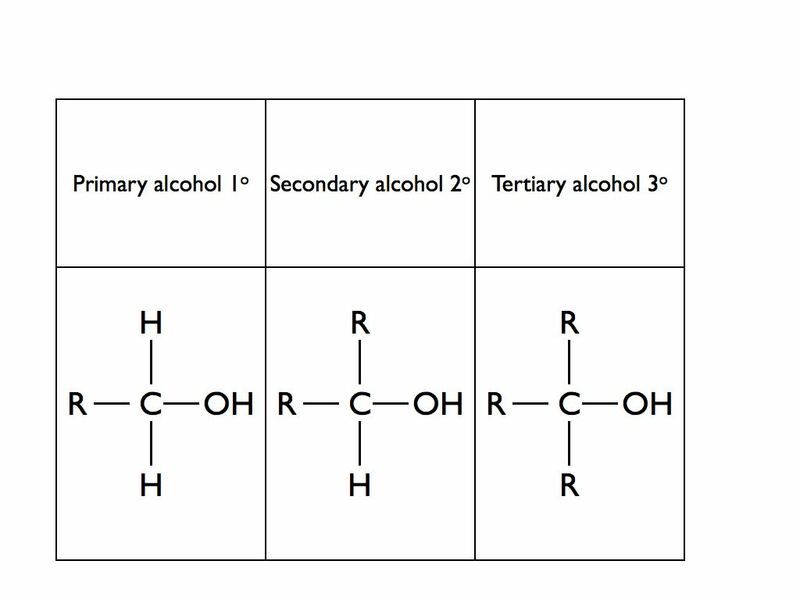 A Level Chemistry students are required to distinguish between primary, secondary and tertiary alcohols. The oxidising agent potassium dichromate dissolved in dilute sulphuric acid will oxidise primary and secondary alcohols but not tertiary alcohols. The alcohol is mixed with a small quantity of potassium dichromate and sulphuric acid in a pear shaped flask. The mixture is heated gently followed by immediate distillation of the product. If the potassium dichromate solution changes colour from orange to green then an oxidation reaction has taken place with a primary or secondary alcohol. If no colour change is observed then the alcohol was a tertiary alcohol. A primary alcohol will form an aldehyde and a secondary alcohol will form a ketone. Tollens’ reagent or Fehling’s solution can then be used to determine if the initial alcohol was primary or secondary. 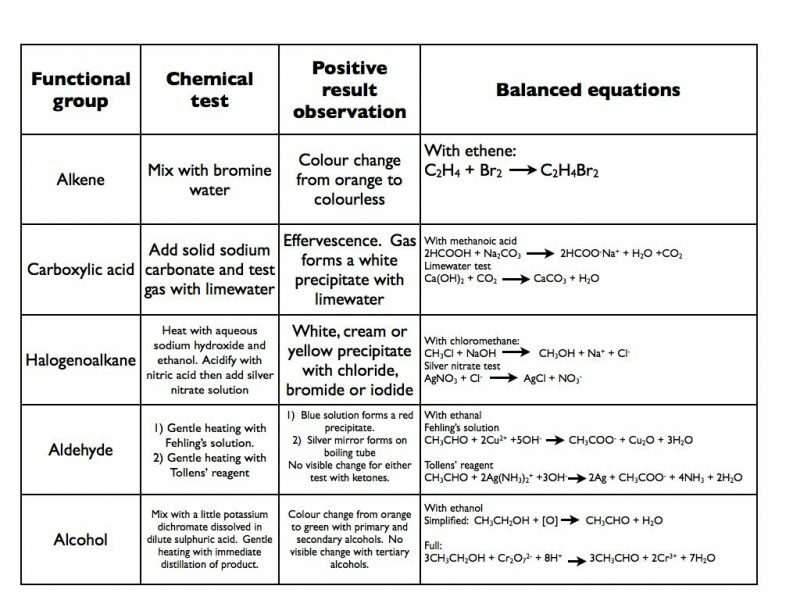 The table below summarises all the tests and the chemical reactions that take place. This entry was posted in A Level Chemistry, Organic Chemistry. Bookmark the permalink.